Heat oil in 4-quart Dutch oven or 12-inch skillet over medium heat. Cook onion and garlic in oil about 4 minutes, stirring occasionally, until onion is tender. Stir in pasta sauce, tomato sauce and Italian seasoning. Spray 5- to 6-quart slow cooker with cooking spray. Place 1 cup of the sauce mixture in cooker. 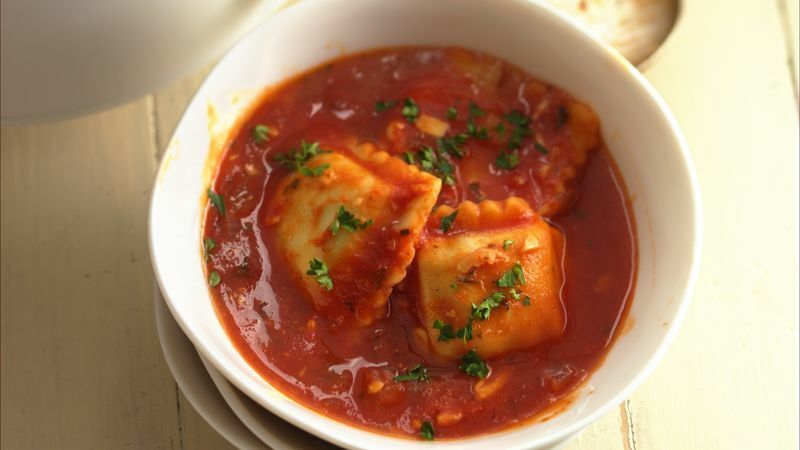 Add 1 package frozen ravioli; top with 1 cup of the cheese. Top with remaining package of ravioli and 1 cup cheese. Pour remaining sauce mixture over top. Cover and cook on low heat setting 5 hours 30 minutes to 6 hours 30 minutes. Sprinkle with parsley before serving. Ravioli will hold on low heat setting up to 30 minutes. Turn this cheesy pasta dish into a great vegetarian meal by using cheese-filled ravioli instead of the beef-filled ravioli. Take a loaf of crusty garlic bread to serve with this family-pleasing pasta dish. A bag of mixed salad greens and a bottle of salad dressing makes this a very quick and easy meal to take with you.